The Baobab Tree is the perfect plant for Beginner, because he is robust, undemanding and easy to care for. It comes originally from Africa and was used partly in Asia as an energy-giving plant. The plant belongs to the family Wollbaumgewächse. In the meantime, monkey bread trees are also represented in many households as indoor plants. The reason: the exotic plant is not only very decorative, but also very uncomplicated. The small tree can easily be cultivated in a pot or bucket and shows good care, strong leaves, fragrant white flowers and tasty fruits. For hobby gardeners who still lack the green thumb, the baobab tree is just as perfect a houseplant as it is for frequent travelers who occasionally neglect to water their plants. In his homeland in Madagascar the baobab tree also becomes referred to as Baobab or African breadfruit tree. The tree is very large and can reach a height of up to thirty meters. Some specimens are already over 3000 years old. Other nicknames for the baobab tree are pharmacy or magic tree, which is also due to the versatile healing effects of its fruits. When choosing the location, keep in mind that the baobab is originally from Africa. So it is adapted to very high temperatures and copes well with drastic weather fluctuations, because in African areas a constant change of rainy season and dry season is normal. In the apartment, the baobab should receive a warm and sunny place. It is important that the sun's rays can not reach the plant unhindered, because in such cases it throws off the leaves. A sunny window seat is well suited. The baobab tree usually grows very quickly, so you should give it enough space. Torferde is not suitable because it stores the water! Always keep the plant substrate dry. The sowing process is different, because the seeds first need a moist soil. The houseplant has no great demands on its care. It requires little water and copes well with periods of drought. Only after cultivation is the African plant a little more demanding, because the young plants thrive only on regular irrigation. In general, you should avoid over-pouring, because then root rot quickly develops. If excess water collects in the coaster when pouring, it must always be poured immediately. Always check whether the plant substrate has already dried and only water in this case. You may fertilize the baobab during the period from spring to autumn up to twice a month. It is best to use a liquid special fertilizer. Additional mineral salts can help the plant to grow and thrive better. Small white flowers only form after five to seven years of good care. In order to optimally hibernate the baobab tree, you should think about relocating. The plant feels most comfortable in the cold season in a cool, yet bright room. The temperature should not be below the 10 degree limit. Do not fertilize the baobab during hibernation and pour it much less frequently. However, irrigation should not be completely abandoned, because then the roots would dry out completely and growth could stagnate in the coming season. In late winter or early spring, you can return the baobab tree to its usual place. The baobab has very pronounced roots that grow strongly. Of course, these roots need a lot of space to really unfold. One of the most important care measures of the baobab tree therefore is regular repotting. At least every two years, a larger planter will be required. You can cut cuttings, repast them for a few days, and then put them in a pot with a suitable planting substrate. By adding a special rooting powder, the cuttings will quickly form roots and you have used a new monkey tree. The European baobab tree does not reach the height of the African variety. To support the small compact growth and to bring the tree in the desired shape, a pruning can be done. We recommend winter months for cutting individual branches, while leaves can be pruned in summer. For a larger pruning, remove the shoots that sit directly under the main crown. The cut should always be made near the bud, so that the branch or branch can later be driven out again. For the inhabitants of Africa the baobab tree is very valuable because of its fruits. After the rainy season, the fruits reach a length of up to 18 centimeters and hang down from the tree on lianas. They look a bit like mangoes, are very healthy and are full of energy. 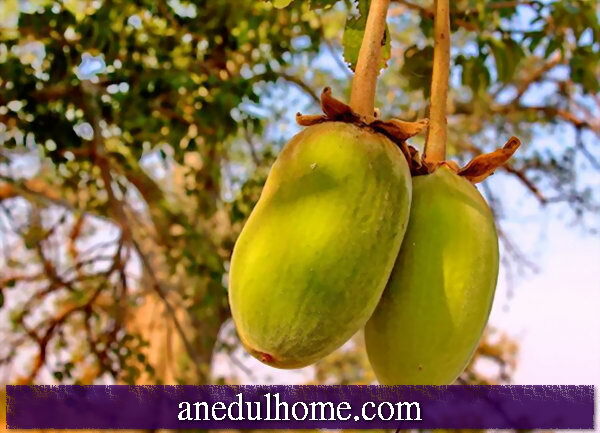 Therefore, the fruits of the Baobab tree also used to relieve bowel problems such as irritable bowel or constipation. We even have the special ingredients of the tree as capsules that are used to supplement inflammation and musculoskeletal pain. What is a Monkey Bread Tree and what does its name mean? The Monkey Bread Tree is a distinctive deciduous tree with an often bizarre habit, which belongs to the subfamily of the Wollbaumgewächse. He owes his extraordinary name to globetrotters from Germany. Since there are many monkeys in the treetop that use the fruit as food, they call it "monkey-bread tree." What does the baobab tree look like? It forms fleshy leaves and strong branches. During flowering, white petals appear. Later, it produces imposing fruits that can even be eaten. Where to buy a baobab? You can buy seedlings online or in the garden shop. But the seed is also commercially available. What do the fruits of the baobab tree look like? The fruits grow up to 18 centimeters in size and hang from the tree on lianas. Visually, they resemble mangoes. How does the care of the baobab tree look like? The baobab tree is very easy-care, unpretentious and robust. He forgives care mistakes and is ideal for inexperienced plant friends. Who pollinates the baobab tree? It is mainly the nectar-eating palm fly dog ​​that pollinates the baobab tree. But also the Nilflughund and the flying fox are among the pollinators. In indoor plants the flowers can be pollinated with a brush. How often should you repot the baobab? Due to its rapid growth, the baobab should be repotted at least once a year to give its roots more space. When and how should one cut the baobab? The baobab does not need a regular cut. Many gardeners, however, prefer a rather small growth, so a pruning is required. It can be done throughout the year. In winter, individual branches may be cut off, while in the summer only a few leaves should be removed. When does the monkey-bread tree blossom? The white flowers show up with good care after about five years the first time. How often do you have to water the baobab? A young baobab must be watered regularly. A fully grown specimen needs water only every two to three days. How to multiply the monkey-bread tree? The propagation takes place with seeds, which are offered in the specialized trade. Before sowing, the seeds should swell. How big does the baobab tree grow and how fast does it grow? Baobab trees, which are kept as indoor plants, reach a height of up to two meters with good care. They grow very fast and have to be repotted regularly. Why is it that the baobab loses its leaves? This often happens after repotting. But even in the case of dehydration, overhydration, or pest infestation, the monkey-bread-tree throws off its leaves. Is the monkey-bread tree poisonous to animals or to humans? For infants and pets the monkey-bread tree is considered to be slightly poisonous. The fruits, on the other hand, are edible and provide many valuable nutrients and vitamins. What soil does the baobab need? The substrate should be air permeable and dry. It is best to fertilize twice a month with a conventional liquid fertilizer. Where does the baobab originally come from? The Monkey Bread Tree is sturdy and resilient, and with its African look it creates a very special flair in your living room. The plant is popular with frequent travelers, because with longer periods of drought, the plant from Africa copes without any problems. The baobab tree is so easy-care and undemanding that it is also suitable for people who have recently been involved in gardening and are still inexperienced. The fruits, which form from the flowers after the flowering phase, contain a lot of calcium and taste slightly sour. They are also used to treat many intestinal problems, because they contain many insoluble fiber.